Some people lost their sense of proportion, others their sense of scale, but Simon Dykes, a middle-aged, successful London painter, has lost his sense of perspective in a most disturbing fashion. After a night of routine, pedestrian debauchery, traipsing from toilet to toilet, and imbibing a host of narcotics on the way, Simon wakes up cuddled in his girlfriend's loving arms. Much to his dismay, however, his girlfriend has turned into a chimpanzee. To add insult to injury, the psychiatric crash team sent to deal with him as he flips his lid is also comprised of chimps. Indeed, the entire city is overrun by clever primates, who, when they are not jostling for position, grooming themselves, or mating some of the females, can be found driving Volvos, hanging out on street corners, and running the world. Nonetheless convinced that he is still a human, Simon is confined to the emergency psychiatric ward of Charing Cross Hospital, where he becomes the patient of Dr. Zack Busner, clinical psychologist, medical doctor, anti-psychiatrist, and former television personality—an expert at the height of his reign as alpha male. As Busner attempts to convince him that everyone who is fully sentient in this world are chimpanzees," Simon struggles with the horrifying delusion that he is really a human trapped in a chimp's body. 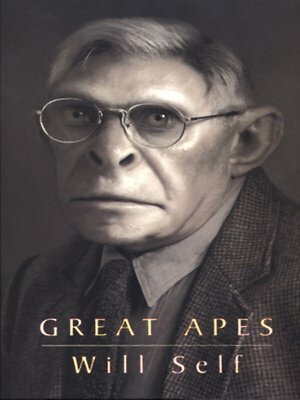 Written with the same brilliant satiric wit that has distinguised Self's earlier fiction, Great Apes is a hilarious, often disturbing, and absolutely original take on man's place in the evolutionary chain. In a strange and twisted tale that recalls Jonathan Swift and Franz Kafka's Metamorphosis, Will Self's comic genius is impossible to ignore.